THE CANADIAN PRESS -- KANDAHAR, Afghanistan - The Canadian Forces have conducted their last full-scale offensive combat operation in Kandahar, but the country's battle group commander warns Canada's war will not be over until all his troops are safely out of the field. 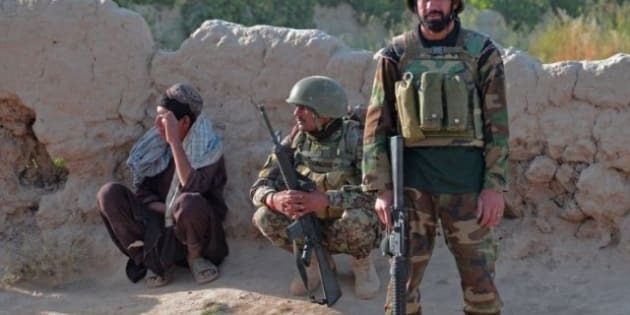 The operation, which took place in Panjwaii district over the last two weeks, was planned and led by the Afghan National Army, and designed to further disrupt the Taliban from conducting spring and summer attacks. It involved more than 3,000 Canadian, Afghan and American soldiers in the scorched farmland west of the provincial capital. The Canadians are in the process of handing over the battlefield to U.S. troops, who began arriving in the region last month. Lt.-Col. Michel-Henri St-Louis says the operation, which officially ended Monday, was a milestone in terms of the development of the Afghan army. But the reality and dangers on the ground for Canadian soldiers living in isolated combat outposts will not change, he said. "The soldiers are going back tomorrow morning or tomorrow night, going patrolling in villages (and) exposing themselves to IEDs or contacts by small-arms fire," said St-Louis, who leads the 1st Battalion, Royal 22e Regiment battle group. "What will be more significant, I would say, will be when we actually give the battle space over in July to the American unit that replaces us, when the soldiers no longer need to be a presence in those villages." St-Louis said the war has evolved to the point where the fight is more at the level of individual platoons dealing with nests of insurgents. Troops participated in clearing operations throughout the Panjwaii region. The operation was particularly notable for the fact the Afghans led from start to finish. "The objectives were defined by the Afghan National Army, the plan was developed by them and the execution was theirs to lead," St-Louis said. There were no battle-related casualties, although a few Afghan soldiers were injured in a vehicle accident. The operation involved four U.S. combat infantry units and gave the incoming Americans a chance to get to know the ground they'll be holding for the next year. Capt. Simon Ouellet, the Canadian officer in charge of Alpha Company's "Lucky" 13 platoon, said he was pleased to have the Americans take part. "I'm happy to see them because it marks the end of the tour," said the 28-year-old Ouellet, who hails from the Quebec City area. With someone taking over their positions, "it shows we did not do this for nothing." "But I feel sad for them, because compared to all of the people that we (have) at the moment, I don't know if at the height of the fighting season they're going to be able to hold it as much as we do." Both Canadian and American commanders say the ground in Panjwaii is saturated with coalition soldiers as the changeover proceeds. Canada's combat mission in Afghanistan is formally slated to end on July 1.